Knowledge, like spare parts or your budget, is a key resource in maintenance. But what happens when an employee walks out the door for good and takes that knowledge with them? The answer isn’t pretty. There’s the high cost of hiring, onboarding and training someone new, not to mention a dip in productivity, reliability, and uptime. This is the hard reality organizations face as turnover in maintenance grows. But it doesn’t have to be. This post looks at how facilities can retain staff and improve the transfer of knowledge to reduce the impact of turnover. What causes turnover in maintenance? 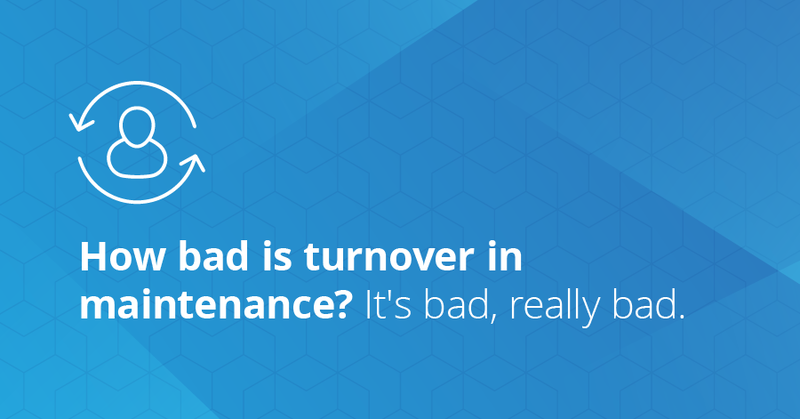 The maintenance industry has a problem with turnover. Although rates vary by region, industry, and position, turnover in maintenance consistently outpaces national and global averages and outranks all but a few industries. According to the Association for Manufacturing Excellence, the average manufacturing and distribution plant has an absenteeism and employee turnover rate of 37%. Another study by the Canadian Manufacturing Network found that the average turnover rate of maintenance personnel and machine operators in Canada is 22%. And, according to the Bureau of Labor Statistics, the involuntary turnover rate (layoffs and dismissals) for maintenance professionals in the US was 4% higher than the national average in 2018. It’s clear that employee turnover rates are higher in maintenance than many other industries. But why? To answer that question, we have to first look at common reasons anyone might leave their job. Recent surveys have found that money is at the centre of between a third and a half off all turnover. However, the hunt for a raise is often a symptom of deeper problems. Work/life balance (13%), a bad relationship with a manager (11%), the quality of daily tasks (8%), and a poor work environment (6%) were all cited as top reasons people leave their job. But what happens when an employee walks out the door for good and brings that knowledge with them? The answer isn’t pretty. It’s also useful to look at why some employees don’t leave their job. A study from the Harvard Business Review found that people were 34% more likely to stay at a job if they found their work enjoyable, used their strengths more often, and were able to develop their careers. These findings can help explain the high rates of turnover in maintenance. For example, if a facility struggles with too much reactive maintenance, staff may spend all day putting out fires. They may even get called in at all hours to deal with unexpected breakdowns. When this happens, everything from work/life balance to safety suffers, creating the perfect recipe for dissatisfaction and turnover. Similarly, working with outdated tools makes it tough for maintenance personnel to access resources and do their job effectively. When they spend more time tracking down manuals, shuffling through work orders or writing notes after a shift, they spend less time using their skills and developing new ones. To top it off, maintenance teams often work under extremely difficult circumstances with very little recognition, which is another big reason they are more likely to leave. High stakes combined with a shortage of gratitude can push maintenance staff, especially young employees, to search for a different career with a better work environment. The last piece of the puzzle is the impact of an ageing workforce in maintenance. There were over 2.1 million people over the age of 55 working in the natural resources, construction and maintenance industries in the US in 2016. That means millions of employees and decades of knowledge will be flowing out of facilities over the next few years. It’s a troubling trend that Deckers has seen firsthand. The cost of turnover is steep. An average business spends 20% of an employee’s annual salary to replace them. Since the average salary in natural resources, construction and maintenance is $43,000 (USD), turnover comes with a price tag of $8,600 per person. And money isn’t the only thing you’re wasting— it takes an average of 42 days to fill a position. That time is spent interviewing, onboarding, and training new staff instead of doing other key tasks. High stakes combined with a shortage of gratitude can push maintenance staff, especially young ones, to search for a different career with a better work environment. These are just the direct costs of turnover in maintenance. There are plenty of indirect consequences that can have an even bigger impact on your operation. For example, when you’re short-staffed, it’s more difficult to keep up with both scheduled and unscheduled maintenance. This leads to more downtime, less production, and lost revenue. Unplanned downtime costs anywhere from $3,000 to $200,000 an hour and results in a failure to deliver services to customers 46% of the time. Finally, if your facility doesn’t have a solid system for storing information, you’re likely to lose a lot of knowledge after someone leaves. In fact, it’s been found that about 70% of an employee’s knowledge is lost when they leave an organization. This can result in fewer resources for existing staff and a longer training period for new employees. The first rule of reducing turnover in maintenance is to forget about the things you can’t change (paycheques, retirement) and focus on the areas you can (creating an efficient, fulfilling work environment). Here are three ways to achieve that. Maintenance is often a thankless profession. It can be frustrating to work hard, do a great job, and get no recognition for it. Reversing this trend creates a better work environment for your maintenance team. Numbers tell the best story. That’s why quantifying performance is important. It allows you to point at a report and say, “We completed 100 work orders last month,” or, “We helped increase uptime by 40 hours this quarter.” It makes the value of maintenance clear and gives maintenance staff the recognition they crave. The result is a more positive culture in your maintenance operation and the entire organization. Dead-end jobs are notorious for their high turnover rates. Nobody wants to go to work every day knowing they will never learn or progress. This is especially true for young workers, who want to be able to see a way forward in their careers. There are three ways to show young technicians that they can have a bright future at your company. The first is a great onboarding and training program. Give them the know-how they need quickly, so they can learn and work with confidence. The second is to prioritize cross-training and continual learning. Expose staff to a variety of tasks and equipment to expand their abilities. Lastly, invest in tools and resources, like maintenance software, that make it easier for junior staff to do their job and learn new skills, so they have more time to learn, cross-train and contribute. Nothing zaps the will to work like constantly dealing with the worst parts of a job. Doing away with these elements will allow technicians to focus on using their skills. Staff are less likely to leave when you give them a chance to do the work they like more often. Minor nuisances can quickly become major ones in maintenance. If your technicians spend an hour doing paperwork after every shift, that’s one less hour they have with their families or recharging for tomorrow. Burnout and toxic workplaces are inevitable in this situation. Avoid this outcome by making information more accessible, targeting inefficient practices and making those annoying little jobs a little easier to complete. It’s tough to accomplish these goals without the right tools. One of those tools is a digital knowledge hub, which is a central platform where everything from SOPs to work order histories and preventive maintenance checklists are organized and accessible. This arms staff with the information they need, when they need it. Empowering your maintenance team this way helps them overcome some big obstacles and eliminates many common causes of turnover. Maintenance managers also benefit from this system. Not only does it increase efficiency, but it allows you to quantify the value of maintenance so it is better understood throughout an organization. You can reduce turnover in maintenance, but you can’t eliminate it entirely. The following are a few tips for dealing with turnover at your operation. Technicians spend years working with the same equipment every day, so they often have asset knowledge no one else does. If you don’t have a system to preserve and share this knowledge, it could mean a long, hard, and costly road back to square one. Enterprise-sized companies in the US waste $4.5 million in productivity annually from inefficient onboarding and training. Nothing zaps the will to work like constantly dealing with the worst parts of a job. One way to avoid this nightmare scenario is to record everything and make your records digital. Having a digital repository for asset information allows staff to easily access and review an asset’s work order history. All the information that might take months or years to learn by trial and error (such as optimal settings or common causes of failure) can be learned in days. Consistency is the mark of great maintenance. But it’s hard to get the same results time and again when your team keeps changing. Standardized processes make it easy to repeat success by taking the guesswork out of maintenance tasks and preventing you from relying on a single, specialized individual. Something as simple as creating checklists for regularly scheduled maintenance can improve standardization. If you want to look at the bigger picture, you can create an asset management policy. This provides a set of guiding principles for asset management and points everyone in your organization towards the same goal. If you can anticipate turnover, it makes planning for it much easier. Crunching the numbers can help you spot trends, foresee potential turnover and survive the aftermath. Turnover can be devastating to a maintenance team. It can lead to knowledge loss, low morale, increased downtime, and more. However, turnover and its impact can be minimized by documenting and organizing knowledge, articulating the value of maintenance, increasing standardization and removing inefficiencies. Maintenance software can play a huge role in helping you achieve these goals while setting your facility up for long-term success.